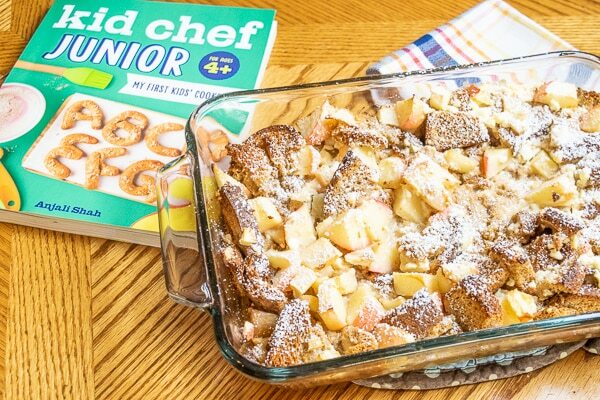 Get your kids in the kitchen with this wholesome recipe for an apple-cinnamon french toast bake. There is even a spot next to each recipe for your child to rate the recipe, note who helped them make it, and includes a fun joke. The pictures include real kids making these recipes which makes it all the more attainable for my kids. 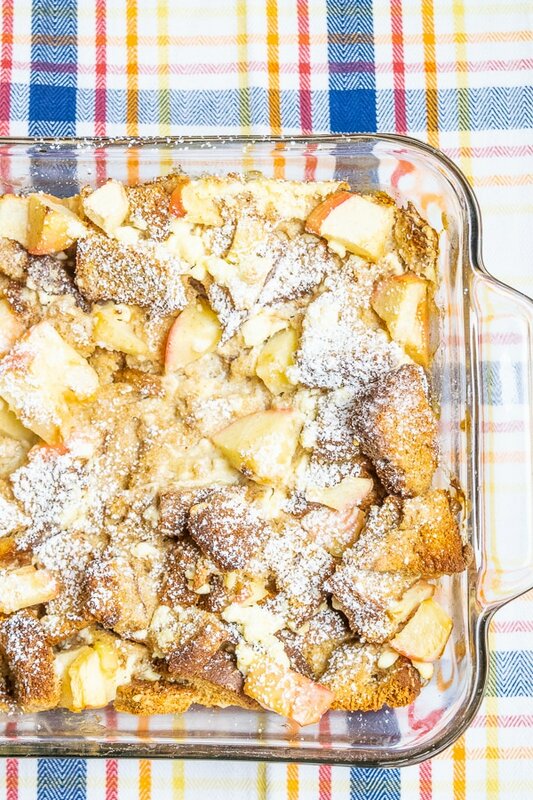 They want to make all of the things (and we probably will), but we started with the apple-cinnamon french toast bake. So much more! Seriously, all of the recipes look fun and yummy. You can grab the book here. When we decided to make this recipe, we already have everything on hand! I didn’t have fresh berries but did have frozen strawberries in the freezer. It worked! Sneak a peek at the video below to see us making this on Facebook Live (edited for time). I would love if you would hit “subscribe”, too. 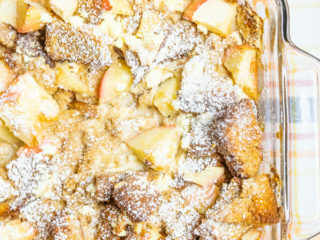 We really enjoyed this recipe for apple-cinnamon french toast bake and look forward to making many more of these recipes. 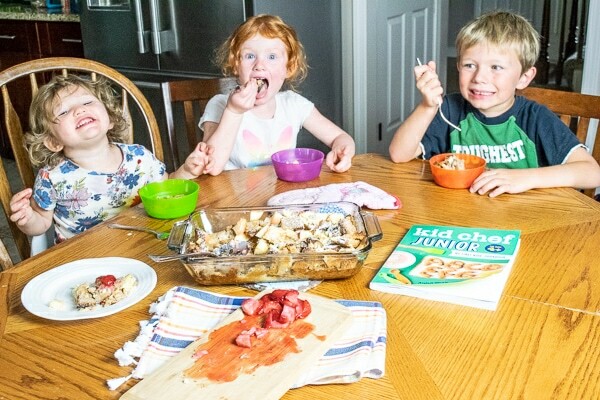 I have shared about cooking with kids several times in the past and really hope to raise confident cooks who can make themselves a real meal when they move out. As mentioned above, I wholeheartedly appreciate that this cookbook includes many real-food ingredients (like whole grains). If you want to swap it out for whatever you have on hand, that’s fine, but it teaches kids to cook while using healthier ingredients. That, to me, makes all the difference. 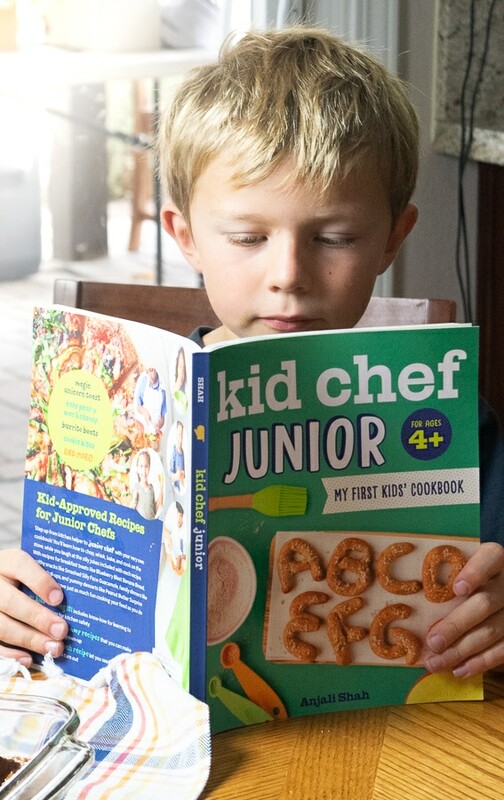 Especially now that I have an early reader who will undoubtedly want to read the recipe for himself. Cut up the bread into small squares. Arrange on the bottom of the greased baking dish. Core the apple and cut into small squares. Sprinkle it over the bread. Mix together the egg, milk, cream cheese, maple syrup, butter, brown sugar, cinnamon, and vanilla extract. 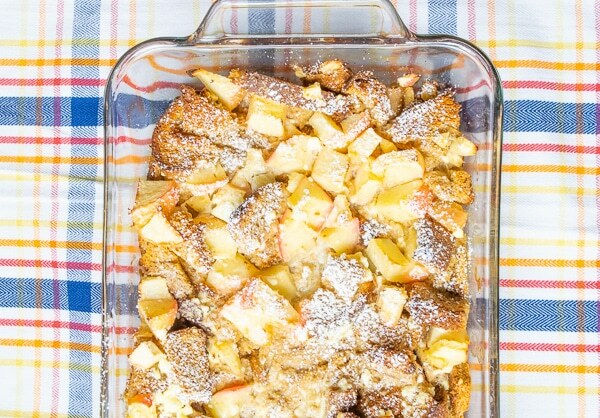 Pour over the cubed bread and apple in the baking dish. Stir the ingredients to ensure the bread is evenly coated. Let cool and then sprinkle with berries and powdered sugar. 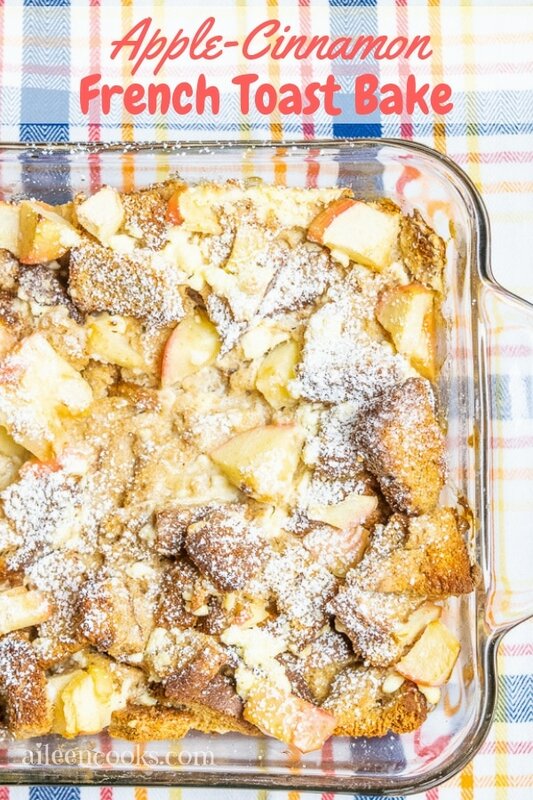 We loved this recipe for apple-cinnamon french toast and getting cozy in the kitchen. We hope you do, too!